This first-of-a-kind system comes complete with everything necessary to clean potentially infectious and used health care materials. Unlike other spill kits, the 1.25-Gallon Spill Kit TakeAway Recovery System goes one step further by providing a means to safely, easily and cost-effectively remove these materials from your location and transport them to Sharps facility for environmentally responsible treatment. The cleanup kit, transportation, and treatment are all included in the price of the kit. Upon discovery of spill, the pail should be taken to the spill site where included directions for cleaning, absorbing, and disinfecting the spill should be followed. The materials including PPE are then placed into the pail. The lid is closed and the pail is packaged per included instructions in the pre-paid box and shipped for proper treatment through UPS. 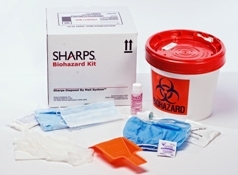 All Sharps items are autoclaved at Sharps Compliance. 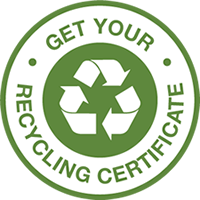 If incineration is required or preferred, please indicate "Incineration Required" in the "ORDER NOTES" at Step One (Shopping Cart) of the ordering process. All Sharps Compliance items are non-refundable, unless the Customer receives the wrong item in error or damaged items, and notifies the Heritage within five (5) business days of receipt of order. IMPORTANT NOTICE: The max return weight on this item is 10 LBS. For every pound over the max weight there is a potential additional charge of $2.00 per LBS.